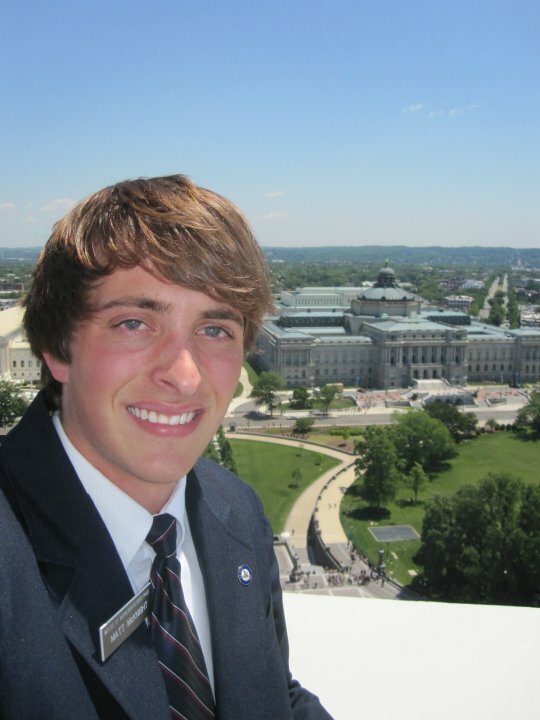 Matt McKnight, the creator of Athens Scanner, while working at the House of Representatives in 2010. Photo provided. There are no beds in Bromley 806. Instead, plush armchairs and a comfy couch crowd a tiny TV that’s usually tuned in to re-runs of “COPS.” A Taylor Swift poster sits primly atop the built-in desks, while a “Party in the USA” era Miley Cyrus guards the doorway—no twerking here. Throw in an American flag, a couple of Ninja Turtles posters, a mini-fridge and a giant, cozy-looking rug that’s way too clean for a college dorm room, and you’ve got the ultimate man cave. But the room’s main feature is a small, handheld device that could easily be mistaken for an old-school walkie-talkie. It slowly sputters to life, but not even the static can hide the dispatcher’s Appalachian twang. Finance major Matt McKnight, now a junior, perks up, fingers twitching toward the keyboard. This is High Fest, after all, and chaos is imminent. He lets out a sigh of disappointment, translating the dispatcher’s code with ease. There’s a brief moment of calm, but the dispatcher might as well be paying housing fees, she’s such a present fixture here. The little black box crackles again. This was Athens Scanner HQ, more war room than dormitory. Now that McKnight has moved off campus, its current location remains a mystery, but he spent most of his hours here, listening and tweeting from 1 p.m. to 3 a.m. daily. Athens Scanner’s much-loved Twitter account currently boasts 8,785 followers, even more than The Post and Student Affairs VP Ryan Lombardi. And their numbers are growing fast—McKnight said he probably gains 20 to 30 new followers on an average day, and a few hundred during major events. The feed hit its first thousand followers during the infamous “fugitive fest,” and broke 4000 during February’s water main break. They’re well on their way to becoming one of the top news sources in the Athens community. After the Nov. 30 Research and Technology Building arson sparked a serious interest in campus crime, McKnight (who has always been a big fan of G4’s “Campus PD”) stumbled upon the Athens Messenger’s online scanner, but was disappointed with its poor quality. After discovering that Athens County is one of only three counties in Ohio that doesn’t offer a live stream, he bought a police scanner of his own over winter break. Tweeting was just the next logical step, and he opened the account on Jan. 23. Colby (left) and McKnight (right) at a campaign rally in Newark, Ohio. Photo provided. He enlisted the help of his friend Joe Colby, a fellow junior and Media Arts and Studies major, to help run the feed and handle all graphic design work. Reception has been overwhelmingly positive. Even OU’s Dean of Students Dr. Jenny Hall-Jones called it her favorite twitter feed. The feed’s few detractors are typically angry (and often drunk) tweeters, upset that they couldn’t find warnings about busted parties on the Scanner. McKnight said that although he gets a kick out of reporting and responding to peoples’ drunken antics, it’s not quite the level of public service he had in mind. McKnight’s gravelly southern Ohio drawl and cool demeanor stand in sharp contrast to Colby’s Zuckerberg-esque enthusiasm for new media. The stoic wisecracker and the skinny-armed idea machine make a great team, but McKnight’s unwavering dedication to public access is the clear driving force behind the project. It’s easy to see why some students might shy away from a venture that borders on vigilantism, but McKnight has zero regrets, even if he suspects the police might not be all that fond of him. Just a typical day in Athens. Photo from Athens Scanner. On the contrary, Andrew Powers, OUPD’s police chief, said he has no problem with the account, and gets every tweet sent to his phone. He still has some reservations, however. “When our every movement is being tweeted, it reduces the random element of surprise that certainly works in our favor,” he said. Powers said he’s impressed with how responsibly the feed is handled, though he has advised his officers to be more careful about what they say. McKnight said he feels he has a duty to respect the police, and he’s also adamant about keeping personal information out of his tweets—even in the case of an OU faculty member who was arrested for public intoxication March 23. Dr. Hall-Jones said she also admires the Scanner’s respectful attitude. Good-natured as they are, make no mistake: Colby and McKnight are troublemakers. They’ve toed the line between helping hand and public nuisance long before McKnight purchased his $99 police scanner on eBay. Last year, they took their commercial brand of mischief all the way to the campaign trail—and made national headlines in the process. 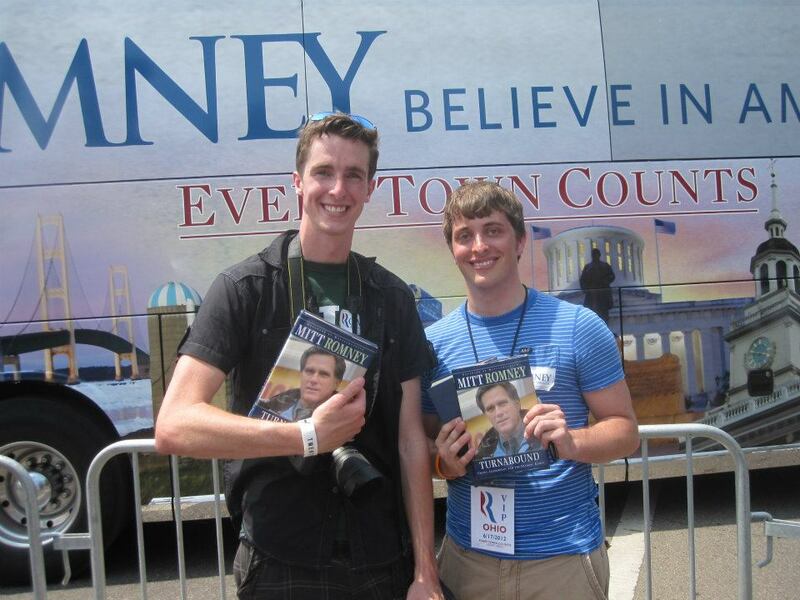 Colby was the mastermind behind one of the Romney campaign’s biggest unofficial social media failures, a Bobcats for Romney campaign video that featured a remix of indie group The National’s “Fake Empire.” The band members, longtime supporters of President Obama, were furious, and had the video pulled. “It kind of backfired, but we didn’t mind,” Colby said. “They should have been honored that anyone cared about their band,” McKnight joked. The feud caught the attention of Pitchfork, Spin and Digital Spy. Colby, who’s also helped produce music videos for Wacka Flocka Flame and Hawthorne Heights, said he was just grateful for the recognition. McKnight was a bit more successful in courting the Republican ticket. The moment Paul Ryan was announced as Romney’s running mate, McKnight snapped up as many Ryan-related domain names as he could—including PaulRyanSucks.com—which apparently startled campaign leaders. 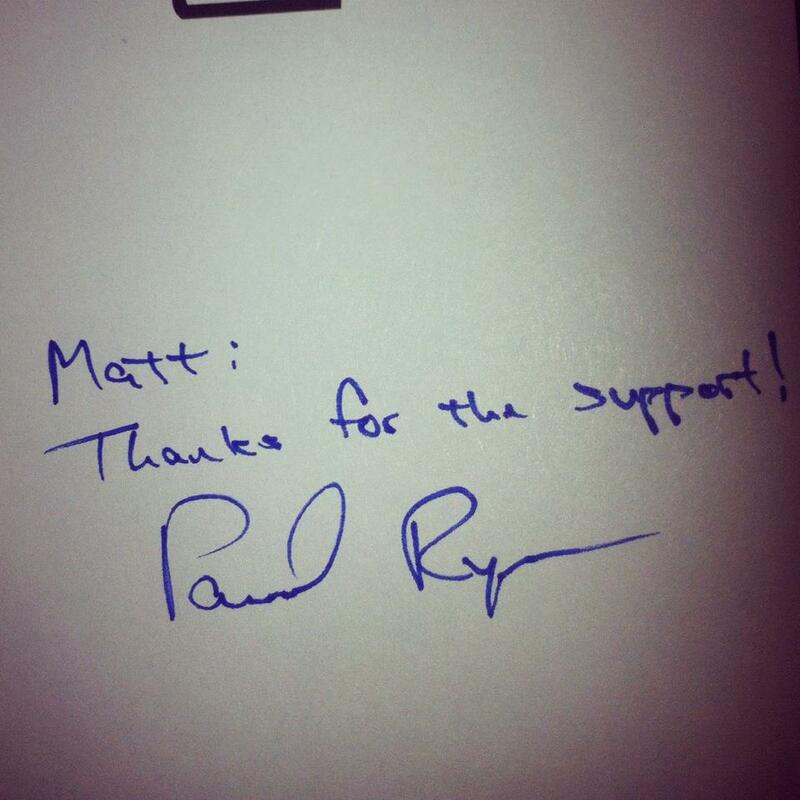 McKnight’s note of thanks from former VP hopeful Paul Ryan. Photo provided. McKnight’s dedication to the cause helped him meet the presidential hopeful eight times—his walls were plastered with snapshots from rallies and Romney/Ryan memorabilia—and fostered a growing entrepreneurial spirit. It’s his opportunistic attitude that will hopefully take Athens Scanner to the next level. The duo has already assembled a team of student volunteers so they can cover more hours each day, and they plan to expand the twitter feed into a full-blown website next spring. Along with live updates, the new site will potentially feature videos and photo essays inspired by the user-generated content that gets tweeted to the scanner on a daily basis. Missing a few calls here and there may not seem like a huge loss, but for McKnight, any tip could be crucial. On the surface, Athens Scanner might just seem like the strange hobby of two straight-laced punks, but it’s already changed the way OU handles crime. When an arsonist set eight small fires in Tiffin Hall in the small hours of Feb. 23, students turned to Athens Scanner first, tweeting pictures, commentary and what later proved to be valuable evidence. 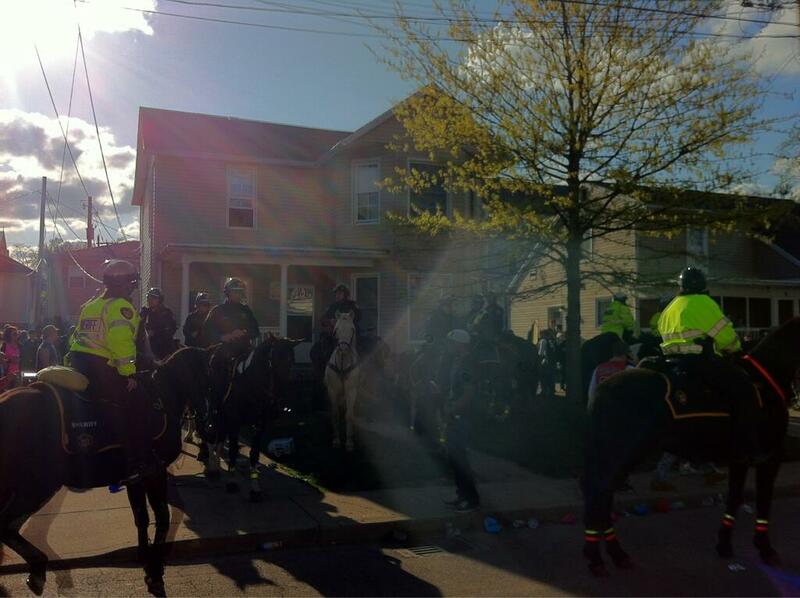 One of the Scanner’s photos of a police shut-down of a Palmer Fest party this year. Photo provided. Dr. Hall-Jones said the feed has also affected the administration’s inner-workings, especially in regards to off-campus student welfare. Hall-Jones found out about the Feb. 23 Courtside stabbing incident through the Scanner, and hopes to continue to use it to touch base with students who’ve been affected by crime. When it comes to more serious incidents, Powers said he’s concerned the scanner’s influence could do more harm than good. Several years ago, a student reported a gunman had entered Copeland Hall. Police evacuated the building, and the alleged gunman turned out to be an off-duty police officer. Despite concerns, it’s clear McKnight and Colby’s venture has become an integral part of the OU community. As for those beds, all four were officially relegated to the other half of the suite. There’s no time for sleep in the newsroom. 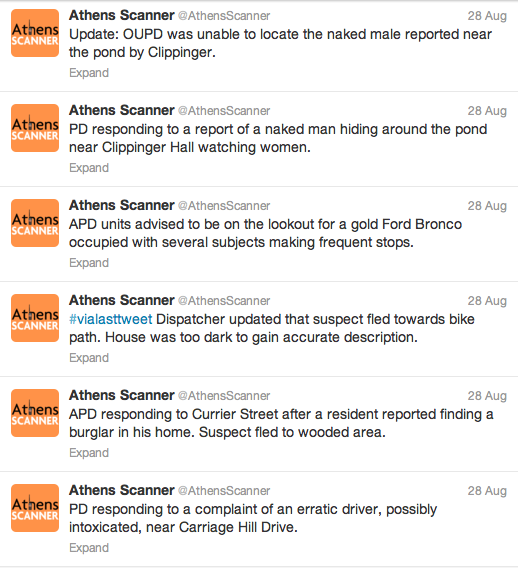 You can find the Athens Scanner folks at their Twitter page. You can find out more about Speakeasy and the cool things we write and take pictures of via your usual social media stuff like Twitter, Facebook and Instagram.